Full Review of the Brook Blossom Skirt from Orange Daisy Patterns for One Thimble Issue 12. It's always a pleasure to host the One Thimble Blog tour! Tour dates and locations are below; be sure to follow along! Hi! It's Katy from My China Doll . I am such a huge fan of the One Thimble E-Zine and have been purchasing since its inception. If you don't know what One Thimble is all about...well, let me start by saying that I think it is a must have purchase for any sewing enthusiast. It is a digital sewing magazine (e-zine) that contains articles, general (and very helpful) sewing tips and tips for handmade businesses too. This issues contains 11 full patterns for boys, girls, home, accessories and even for yourself! It features 26 sewing articles too, which makes it such great value for money. It is released quarterly or available for subscription. I eagerly await each release for a chance to sit down to have some mama time and decide what to sew. 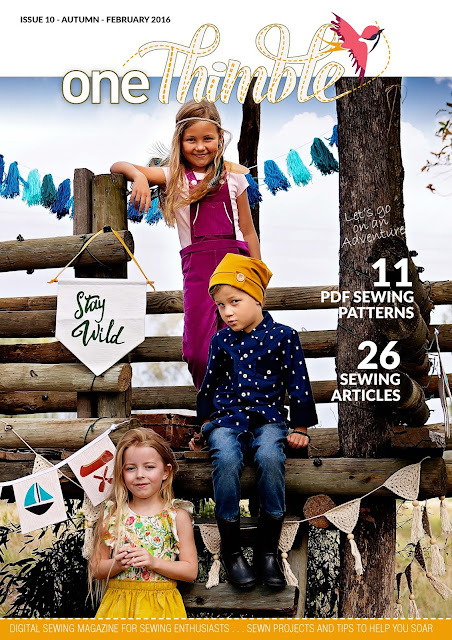 Deciding what to sew from this issue was such a dilemma for me, I was inspired to sew it all. I decided to go with a girly urban feel for my photoshoot, so I started with the “stay wild” banner by Swoodsen Says. It was a really fun home décor project. The felt applique wasn't as hard as I though it might be to create (I am a novice in the world of applique) and I can imagine the endless variations possible by using different materials or appliqueing different text or images. Using the lace prettied it up, and I didn’t have any wooden dowel on hand for the casing so I used wide straws instead and fed the lace through their centre. I also had to include the Enid slouch beanie by Rosie Petal which is such a stylish pattern and such a quick sew too. Because I used a quilted knit, the pattern recommended I size up and it was a perfect fit. I didn't use the button tab feature but did sew a fabric covered button on instead. I love that it is sized from 12 months to adult so I could make one for me too! To complete the look I used the Jolie skirt by Filles a Maman and made the front pleat option in quilted knit. Such a simple sew but I love that I am able to use either woven or knit fabric for it. Fabric selection can really alter the look of this skirt so it is suitable for year round wear. It features an encased elastic waistband with several parallel rows of topstitching give a great finish. On the front of the waistband there is a faux bow tie and I used an embroidered lace for mine. Another favourite pattern in this issue was the Claudia dress by Bugaloo Basics. I made the long sleeve in a light cotton poplin so that it was suitable for the transitional seasons. Its construction is both simple and clever, I love the front button placket and cuffed sleeves. The use of bias trim on the neckline is a nice change and it meant there was no lining piece to attach. I know I will be making more of these dresses for my girls for Autumn. I just have to mention the stunning photography and styling of the e-zine too. It makes for a delightful read. It is well laid out and I especially love the hyperlinked menu with its contents broken down into regular features, special features, sewing techniques, sewing tutes and handmade business articles. There are so many interesting articles in each issue and this one is no exception. I especially enjoyed the insight into Instagram marketing and the tips for perfecting piping. I absolutely love the adventure theme of this issue and can't wait to sew up the adventure kit by Felt with Love Designs and treasure map embroidery by Hugs are Fun, because they are such great tools for imaginative play. I also have plans to sew the clubhouse cushion by Hunting for Ladybugs, as I know it will be an awesome addition to our playroom. And the Enid Beanie, sewn by Kim Wilmes. It's that time again, where we get to bring you what I think is THE top sewing e-magazine around. I love that we've been able to partner with Jen of Ainslee Fox and One Thimble to introduce you all to this Aussie gem. The e-zine is packed to the brim with new patterns, articles and features from designers all over the globe and is well worth every penny! I'm going to turn it over to Paige for the review of Issue 7 of One Thimble and then after that you'll get to see what our other reviewers sewed up!